Polypipe, the UK’s largest manufacturer of plastic piping solutions, has opened a new technical centre in Dubai aimed at further strengthening its presence in the region. Located in Jebel Ali Free Zone, The Middle East Technical Centre will provide hands-on working product displays, installation and design training, challenging traditional materials and methods of installation required to manage drainage and water management solutions specific to the Middle East, said Polypipe, which manufactures above and below ground drainage, plastic plumbing, storm water management and water conservation systems. 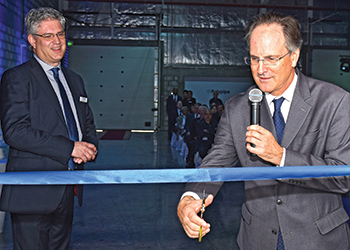 The facility was inaugurated in October by British ambassador to the UAE Philip Parham, who said: “The opportunities present in the UAE market are huge, and it’s great to see a leading British manufacturer fully commit to the region. “I’m sure that Polypipe will continue to play a key role in the management of water in the region’s key construction projects. We want to encourage more British companies to follow Polypipe’s approach and maximise the export potential of their products,” said Parham. Polypipe said its centre is now open to those in the industry, enabling them to overcome key local challenges in the Middle East and Indian construction markets, including complying with the latest regulations to stay ahead of fast changing developments and sustainable urban city requirements. Polypipe has manufacturing facilities and offices across the UK and Europe, as well as offices in Dubai and Doha, Qatar, and has a history of supplying products into the Middle East for over 50 years, leading the way in water management in the Middle East. The company said its solutions have been specified for high-profile projects such as Zabeel Palace, Habtoor City, and the Dubai Opera House in Dubai; Al Mafraq Hospital in Abu Dhabi; and Doha Festival City in Qatar.